I am guilty of having a Sam’s Club Membership. 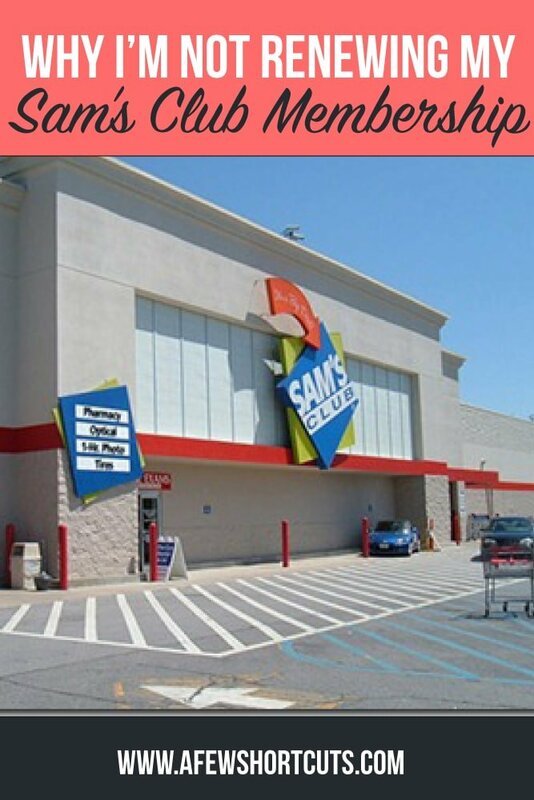 I know I blog about couponing, and Sam’s Club does not accept coupons. I felt like I could still get some deals on produce and meat. Well, I am not renewing my Sam’s Club Membership, and this is why. I know my prices. That is what I do. My job is knowing if prices are at their lowest, and Sam’s Clubs are not. Why do I pay $45 a year to “belong” to Sam’s Club, when their prices are the same or very close to Walmart or other retailers. I have even found some items to be more expensive. I can get my produce at Aldi, and meat from Zaycon Fresh at a drastically lower price and way better quality. Sam’s Club does not accept coupons, but they do have these new e-values that you can take advantage of if you upgrade your membership (by paying almost $100 a year). These values are chosen by Sam’s club and you can only use them once per membership. Not enticing enough to make me sign up. Now, I pay for my Sam’s Club Membership to get low prices, and to have a hassle free shopping experience. However, every time I go into Sam’s Club I am approached with a sales pitch. Lately they want me to sign up for Directv, upgrade my Sam’s Membership, or Purchase a TV. I am sorry, but I pay a yearly fee to go about my business. I really don’t want to be nagged every time I go into the store. I purchased a 5 lb bag of Oranges for my family last week. (My last trip to Sam’s.) Within 2 days they were moldy. I understand that I can carry that bag of moldy oranges back and get my money back (Which I will do), but I shouldn’t have to. The point is I am paying a premium to have a quality shopping experience. I really feel that I am not getting what I am paying for. I will continue to shop the sales and my local stores with coupons. If I find I am missing my big Sam’s Club purchases, I know I can buy the same items at Walmart for comparable prices. I think it is all in being prepared and making time to plan my trips. If I stay organized and shop the my local sales, I know I will save plenty of money and continue to have the food my family needs on hand. How do you feel about Sam’s Club and other warehouse stores? Do you have a membership? I have a large family and do some price comparison. For us the convenience of having Sam’s associates pick out all our items for purchase and roll them out ready to put in the car Click n Pull is definitely nice for this mom with 6 under 9 years old. I don’t get my produce there but frozen good and often times can goods are the same price as other places on sale. And as you say similar to WalMart. Couponing is an on and off activity for me but I find more useful for our personal grooming items. The gas savings is something that I appreciate. I saved .25 a gallon for gas using Sams and with our gas gussling 14 passanger its worth it. Not to mention Sam’s is closer than WalMart. I am totally with you…I did a Sam’s membership for a year and will never do that again! I quit Sam’s Club 4 years ago when I got heavy into couponing. For me SAm’s club is 1 hour away. There is NO savings in shopping there. I found I couldn’t shop there for less than $300 a trip & still would have to go to the store for things. The produce does spoil fast. The straw that broke the camel’s back was the ramen noodles were cheaper at Wal-mart (5 miles away) than going to Sam’s club. Sam’s club can’t even compete with coupons! Not to mention HUGE long lines too. Go Figure! My husband and I just had this conversation! It makes no sense to pay to shop. 14 passenger van excluded! I totally agree w/ everything you said. I paid $100 for mine & it’s 2 miles away. I never shop there. I don’t even buy gas there b/c it’s not much cheaper them going to the gas station right by my house. I used to think like this. Then I started looking at the bulk meat prices…when you buy by the case. In my area (GA) even when I take meat sales into consideration I can beat the bulk price on ground beef, chicken and pork. Also I can get milk there at least .50 less a gallon than even walmart (which is next door). Last week it was .80 less per gallon. I don’t get to go there every week as it is about 35 miles from my home. But we try to go once a month and pick up a large amount of milk, butter and eggs. About every six months we make a large meat purchase. I hate the fact that they do not take coupons but the savings on the few items we get there is worth the price of the membership. Also, I am in college now and if you ask when signing up for membership there is a $15 membership discount when you show your college id when signing up. (of course the amount of the discount might be different in different areas). Even the meat prices aren’t that great. My Sam’s had boneless skinless chicken for $1.99/lb and next door at walmart it was $1.88/lb. Same chicken, but different price. I have found if I buy my meat on sale, and purchase in bulk then, I am still getting a better deal than Sams. The small savings on 1 or 2 items isn’t worth the cost of the membership to me. My grandfather and I share the membership (it’s like 2 miles away from us), he doesn’t shop there often but loves to just go and walk around and I know he does it to help us out since he doesn’t worry about money. That being said we pay about $20ish for the year membership, on the years that he lets me pay him our part usually he just says to make him dinner, which we do multiple times a week. Chicken, milk, bread, their yogurt protein shakes ( don’t know the real name but they are always by the fruit) and lunch meat are the main things we buy there. I stocked up on chicken for $1.77 a lb for boneless skinless breasts and it’s cheaper than I have found anywhere else. The milk is $1.00 less at ours than it is at Walmart or the grocery stores around here. If I had to pay for the full membership we wouldn’t shop there but since we’ve had a membership most my adult life and I’ve compared the prices locally I know what to get and not to get there. But we did cancel our Costco membership and although I miss it, I like that I can go shop w/ a friend and just pay her cash for whatever I need. I get it and agree that it is a good move in general. I never really used my sams club membership. never one near me but I use my costco one a lot. I have gone down from the executive membership $110/yr to the $55.00 per year. I am comfortable with that for right now. Save yourself some $ and CANCEL now instead of just “not renewing”. I did when I got tired of how I was being treated. They will refund your membership in full if you are dissatisfied! As a mom of 8 I have seen changes in Sams (NOT good ones). Dvds are higher then walmart, no jumbo canisters of Carnation instant breakfast, bear creek soup or peanutbutter. I discovered GFS which is a non membership fee club. They have basic foods in large sizes (spices, fish fry, meat , frozen perogis etc). the last straw for us was a $7 check. If you use the “sams discover card” you earn a rewards check. However you MUST redeem the check at Sams instead of being able to cash it like a regualr DC check. . I travel 45 minutes to get to Sams so only went 1x a month. The machine wouldn’t read the check, ended up chewing it up. Keep in mind I was online with my kids and over $200 worth of groceries. I am finally asked to leave the line and go to CS. Well CS basically tells me too bad, they can’t figure out how to process THEIR SAMS check! By this time my groceries were melting and still not paid for so I told them to keep their groceries and refund my membership! they lost my business over $7! I’ve had both Sam’s and BJ’s and I agree that BJ’s is the better of the two. My husband and I were discussing how much we’ve saved since joining BJ’s. The main reason is that we haven’t been going to Walmart. Seems every time we walk into WM it’s $100. Even with coupons LOL. Just buying milk alone would pay you back for the membership fees. Its been $1.78 for months now. Strawberries are wonderful there in the summer. Their snack bar is extremely cheap. I took my dad, his wife and my son there and bought everyone lunch and it was around $11. I have found many items that are way cheaper than Walmart including chips, baby formula and the huge cans of countrytime lemonade. I am an advantage member and have gotten some great deals that way. $5.00 off of a 3 pack of sunscreen was a good deal I just got. Coercion is definitely leading the way with prices and their coupons, but Sam’s has some good deals as well. But with shopping the deals and coupons you can save so much more! Sam’s club may have the convenience, but not the best prices from what I have seen. I guess that I am the sole lover of Sams club. I even pay for the upgraded membership. The milk and egg prices are great. We often buy clothes there and get great deals. But the big cincher. We have no medical insurance. Every dang store in town charges me 90.00 a month for my one particular prescription. Sams gives it to me for 35.00 with my premium membership. This year I received it at a discount and paid 70.00 for it. That one membership saves me 555.00 a year. For me, thats my only option. We have tried other drugs and they dont work me. They arent out of my way . I will continue to stick with Sams. I agree that I get great savings couponing . In fact, mine are extreme. But, Sams serves a very valuable part in my budget. My husband and I debated whether or not to renew our membership and we decided to go ahead and do so; that was 4 months ago. We did it because at that time, his medication (diabetes) was the cheapest there. However, since then we discovered that Harris Teeter (we live in Virginia) has FREE diabetic medications and 3.99 generic meds, we don’t shop there anymore. I will more than likely not be renewing our membership! I agree we brought a Sam’s membership was a hassle for us as we live in newton and it’s in West Des moines. they have a few items that I can’t get or I like to get in bulk any where else so four my share a fee make list the one whose name is on the card goes a picks up everthing if they se something new text the rest and we decide if we’re interested or not it works for us. I won’t shop at Sam’s Club or Wal-Mart for two reasons: 1) philosophical differences and 2) employee policies. The Walton family donates money to organizations and causes that I disagree with. I also have had first-hand anecdotal evidence from students of mine (I teach college) of how Wal-Mart treats its employees. I try not to shop at stores that do not treat their employees well. As a Publix shopper, I find I get better deals at Publix with coupons anyway. My boys are both still young so we can manage our grocery needs well enough at stores like Publix and Target. Sam’s Club is close to my husband’s work so he goes there about 1x/month. We get the 25 lb bag of rice for $8.00, he and the kids eat rice about 4X/week. I don’t know where that deal can be beat. We also buy frozen breakfast items and giant containers of soy sauce there. Occasionally he’ll get milk or meat (usually the meat that’s been marked down for quick sale) but we never buy fresh produce or much of anything else there. We also pick up things for our in-laws as it is hard for them to get there due to health issues. I could easily live w/out the membership, but hubby likes it! We shop at SAMs and we are a family of five and I am a huge couponer and here the milk like some others have commented is .50 cheaper than any other stores and Walmart doesn’t have bulk chicken any where close to the $1.99 a pound that SAMs does just in those two categories we are already getting our money back for the membership and we buy the minute maid juice in bulk and frozen breakfast items in bulk way cheaper than any other stores I have done price comparisons with coupons even with sales and coupons I still get things cheaper, everyone has their own opinion and prices and sales vary by each state and city so for some it might not be worth the cost of the membership versus shopping the sales and using coupons but for us we shop there weekly and it is only about 10 miles from our house so unless there prices go up we will keep shopping there, we do agree about the sales pitches but usually before they start their pitch we say we’re not interested or steer clear of them. A couple of years ago, we got a Sam’s club membership with the sole purpose of buying diapers and baby wipes there. After a while, we switched over to the Target brand diapers and wipes and regretted getting the Sam’s membership. I agree, you can get better deals elsewhere by shopping sales and/or using coupons. From time to time Sam’s has a free weekend for non-members (with no surcharge) and we usually take advantage of those. But, I bring along my price list to make sure we don’t end up paying more for something there than I can get elsewhere for less. I definitely don’t think a membership is worth the cost, but I suppose it depends on each family and what types of things they buy. For us, there is no way a Sam’s membership saved us money in the long run. We buy household items there as well (small appliances, yard items, etc) that are usually cheaper. I like to go early in the morning and pick up their marked down meat it is cheaper than the grocery store. I have to agree with previous posters, I cannot get milk as cheap at the grocery store. I also pick up clothes at Sam’s at very good prices. After the membership cost, I may break even or even save, but it is worth it for the variety. We have an executive Costco membership. I have never belonged to Sam’s for all the reasons you state. We used to have a BJs in town, but they closed. That made me so sad, because BJs actually accepted coupons. Costco will send us coupon booklets every month, and sometimes their coupons line up with stuff I need (for a great price). My husband owns his own business, and the Costco membership pays for itself just in savings on his credit card processing terminal. We get a rewards check every 3 months or so. It’s usually about $80-$100 per check. I feel like our Costco membership is worth what we pay. We really love Chobani yogurt, and it never goes on sale at my local grocery stores (Chobani has printable coupons on their site, but they strictly limit what you can print). Regular price is around $1.25. I can get a case of 12 yogurts at Costco for $10, which to me is a great price. You couldn’t pay me enought to shop at Sam’s Club. Afterall, it is WalMart, and I just despise that whole organization. I LOVE LOVE LOVE Costco. I pay $110 for the Executive Membership at Costco, but I get that $110 back plus some every year with the 2% back. I love that Costco has higher standards on the food that they sell. The only thing that I don’t like about Costco is that they don’t have signs up anywhere (they want you to wander) and that they tend to move stuff around too much, but that is just a minor inconvenience. Costco also has the best return policy EVER!!! I took back a wireless printer that I had owned for 14 months. HP wouldn’t even talk to me to help me fix the problem without me giving them my credit card number because I was past the 12 month warranty. Costco gave me my money back and I went right back into their store and purchased another printer. Oh yes, one more thing. Costco actually sends you a coupon booklet every month, and they are actually for items I use. It is a bummer that they don’t take “regular” coupons, but I can live with that. I love Costco!!! I agree about Costco. I loved it but we cancelled our membership and now just go shop when a friend goes. But I have heard that about their return policy and love that! It’s just part of Walmart anyway. Can.t stand the lines in Walmart. I’ve seen the frozen food sit in the isles, until the water drips off, because it isn’t being put in the freezers fast enough. WAY too much Chinese crap in the store. Goodyear tires, has been my only purchases for a long time now. I’ve turned into a serius Publix fan, their bogo’s beat Walmart prices everytime. I am also an avid couponer and find that most of Sam’s prices are not good compared to what you can do with coupons and sales, except for a few things. One of them is noname medications, like zyrtec and claritin. If you are taking them daily and don’t mind a bottle of 300 or so, then you can’t beat the noname medications price. I so wanted to not renew my Sam’s club membership and I compared Walgreens, CVS, Walmart, Target and my local grocery stores prices on my noname Zyrtec Sam’s saved me half the membership cost on a little over a year’s supply. The only other place I could find it close to that cheap was Dollar Tree and for some reason that bothered me. Not sure why I wouldn’t but them at Dollar Tree. Milk was cheaper there than other places, last I looked but I can beat that price every few weeks with the CVS after ECB price and the free milk with General MIlls or Kellogg’s deals, etc. So if I need a gallon, I tend not to drive to Sam’s but if it was closer, I would, or more in my normal driving route. Rice would be a good deal, but I didn’t notice brown rice when I looked in January, and we tend to eat brown rice primarily. I did renew my membership but haven’t been back since, so not sure if it is worth it or not, will have to see. If you have a large family and/or a freezer, you really need to look at their case pricing on meat. I have bought boneless port loin for 1.69/lb! Their case price is usually at least .20-.30 a pound less than package price. Pillsbury frozen Grands biscuits are so cheap there also, around $5 for 35 biscuits. You have to know your prices and shop accordingly but I still see value in Sam’s. I agree they should stop pushing the upgraded memberships at the checkout, it does get bothersome. DO NOT eat the samples from Sam’s Club. I do not belong and never have, however, I attended a no upcharge free weekend. I wanted to check some prices. There were free samples of various things, so of course, I imbibed. Three hours after getting home I got extremely sick and vomited for the next four hours. NEVER again will I eat any samples at Sam’s. I heard about Sam’s Club with the E-centive coupons, but when you actually look at it it’s not a savings at all. You pay $100. per year and can save up to $300. per year… I think I would rather save that money ad shop local and save $200 or more each month than to only save $300 per year. That is a big difference and I’m all about savings… I won’t even go into Sam’s Club or Walmart… they are higher than my local Safeway and Smith’s. And besides that at Safeway and Smith’s I can earn Gas Rewards which really help at the gas pumps. I have a Costco membership. Where I live there are only 2 grocery stores Walmart and HEB. I have a membership at Costco because our Walmart always gives hassels about coupons and many times won’t accept online printed coupons. Even when you talk to a manager. It is just outrageous. Our walmarts make you wait hours in line sometimes so costco is just plain easier and cheaper on all produce. It is hard to find fruit for under a dollar a pound around here and Costco always has it. (Except bannanas.) Also Costco are very picky on their produce. They have good quality in comparison to our two stores. Plus Costco is closer then the other stores. Wal-mart is the worst store ever. HEB is better but without any other competing stores their prices are still pretty high. So Costco is the decent option around here. We are proud Sam’s members and will stay. It is a short drive for us. We get gas there weekly and pick up milk, oj, breads, fruit and veggies (grape tomatoes and carrots- our kids really put these away). When needed we grab eggs, butter, chips, meat, bottled water, book/dvd and occassion clothing deals, glasses and photos(they do my X-mass photo cards every year. I might find things at Walmart for around the same price when you factor in the yearly fee but for me Walmart is further away and INSANE to get in and out of. If I am planning a Publix trip and they have bread, bagles or chips on Bogo then we pick them up there instead. I did check out Aldi for produce but the one near me (but not near anyplace need to travel to) had homeless people sleeping outside the door (so I’ll pass, I don’t tend to have cash anyway). We tried BJ’s a few years back when they had the free-upgraded to the year membership and then canceled after we walked around the store and found things more costly than Sams (BJ would also be a 30 minute drive so no thanks). We have a Costco that is the same distance as Sams-if they ever offered a free pass to visit I think we might consider it-but we pretty much have our Sams visits down to a science now. We quit renewing our Sam’s Club membership about 5 years ago. We too found the prices we not any cheaper than Walmart. I do miss shopping in the clothing department because they do have a better quality of clothing than Walmart. We always overspent because temptation was so much greater. So we chose to not be tempted and just not renew. Walmart and Sams carry different size items. Sams has the bigger sizes THAN Walmart. When you buy in bulk you pay less! 50 pound rice $16-17 bucks. 20 Pound rice any where else,$ 11-17. My sister and I have had a business membership since 2000. I went to Sam’s this morning before 7:30 like I have been doing for over 16 years and I was told that they changed it and business members are no longer allowed to come in on Saturday’s until regular business hours so I left and went shopping somewhere else. The plus memberships are the only ones that have that privilege now. I also found out they no longer offer business memberships anymore which our memberships were renewed less than a couple of months ago. It sure would have been nice if they notified us about the change. We signed up for the business memberships to avoid all of the crowds and hassle of dealing with long lines. To upgrade to the plus membership it would cost another $55.00. It is all about the profit when it comes to corporations. I do not think I will be renewing my membership after it expires. Besides they are replacing a lot of the name brands items with their brands and doing away with several items as well.